If you are one of the married couples who are not at all interested to punch a hole in their pocket and opt for a Kerala trip or doesn’t have much love for the seashore of Goa, a North East holiday tour package will work the best for you. Not only can you choose from a wide range of tourist destinations but also create some memories during your honeymoon which you can cherish for years to come. North East India not only offers ample places of scenic beauty but also provide the ideal landscapes for a candle-lit gourmet dinner, try one of the adventure sports with your better-half or simply relax with a couple-spa therapy. If you don’t have enough time for an extended honeymoon, opt for any of the places stated below. Including Darjeeling in your Sikkim Tour Package is a must if you are willing to enjoy the heritage toy train ride as you travel amidst the lush green tea gardens. Not only is Darjeeling famous for being the first hill station from British Raj but still have numerous splendid attractions to offer the tourists, including the Everest Museum, the Natural History Museum and the Happy Valley tea estate. Spend some romantic time with your spouse in the arms of the Senchal Lake. The panoramic view of Mt. Everest from the Tiger Hill will help you create some magical memories. If you are willing to visit a place in West Bengal which can be the ideal background for some brewing love, Kalimpong is the ideal place for you to be with all the towering mountains surrounding you. This peaceful destination has its own touch of mystic and famous for a wide variety of flowers including roses, orchids, gladioli, amaryllis and dahlias. You can catch a glimpse of numerous romantic blooms in the splendid nurseries, plan a picnic in the banks of Reang and Teesta rivers or enjoy the scenic beauty of the plains from Darpin Dara. Ask your travel agency to include Kalimpong in your North East Holiday Package and visit the three important monasteries in that area to seek blessings from the Almighty. 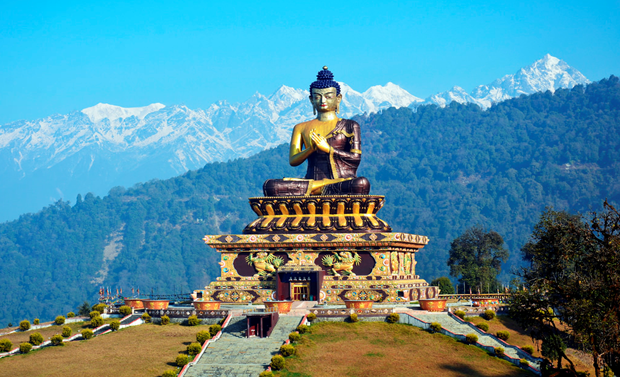 Not every including Gangtok in their North Sikkim tour package is aware of the fact that it is one of the most famous honeymoon destinations known for its scenic beauty and adventure sports. If you want to buy something to keep the memories of your honeymoon fresh, try the much-admired cottage industries or the Naya Bazaars and buy some wall drapes, fur articles or Sikkimese carpets. The shopkeepers are quite open to bargaining so use your negotiation skills for the best price. Visiting the splendid Tshangu Lake is a must before you end your honeymoon journey. Since you are now aware of the famous tourist destinations you can opt for your honeymoon, it’s time you approach a reliable travel agency who can craft the ideal North East tour package for you.